How can I download LoMaps to my mobile or tablet? All new Locus Map users (both Free and Pro) are automatically rewarded with three free LoMaps. It is a gift from the Locus Team to their users for installing Locus Map application. 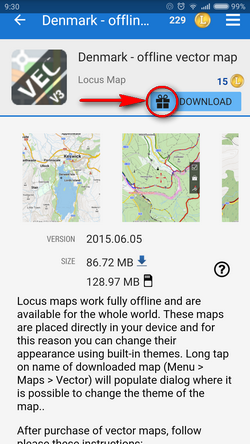 It is the same as with all other maps provided by the Locus Map app – they are available in the Locus Store. Locus Store can be accessed by tapping Menu > Locus Store (you have to be online), then select the Providers tab. Find Asamm SW > Maps and you can browse a wast portfolio of map bundles. When selecting a map from a folder it is possible to display the map packets on a preview map – it makes clear what areas are covered by which map. The blue button DOWNLOAD in the map detail screen contains an icon of a parcel. Tapping it a dialog appears confirming that the map is really free and displaying number of remaining gifts.